Thomas Dillingham is a longtime faculty member in the Languages and Literature program at Stephens College in Columbia, Missouri, where he teaches folklore, mythology, Milton, Blake, and British romantic poetry. Morton D. Paley is the author of Portraits of Coleridge (Oxford). His Apocalypse and Millennium in English Romantic Poetry is in the press and will appear in 1999. 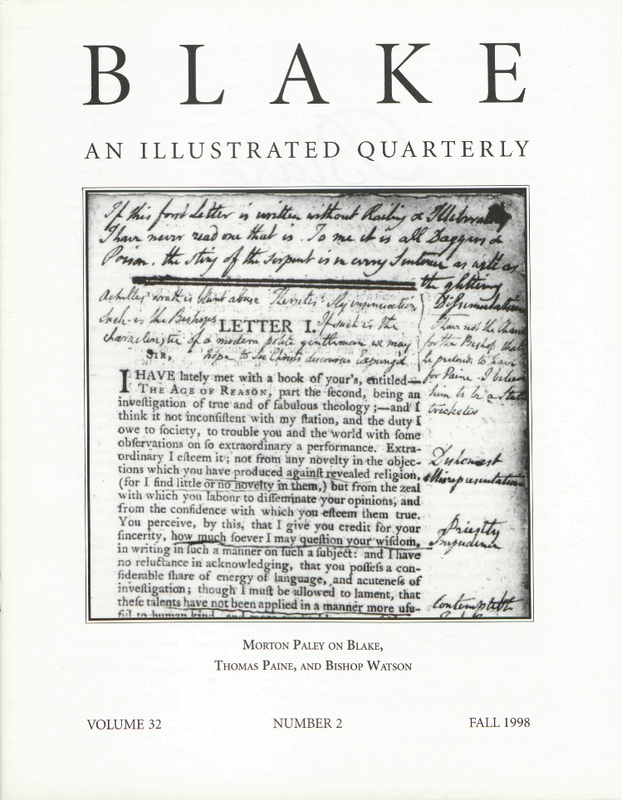 Sheila A. Spector is completing a two-part study of Blake as a Kabbalist: Part I—The Development of Blake’s Language; and Part II—The Development of Blake’s Myth. David Worrall is Reader in English Literature at St. Mary’s University College, Strawberry Hill, England. Blake in the Nineties (with Steve Clark) is forthcoming from Macmillan[e]/St. Martin’s Press. Cover illustration: Page 1. The annotations around the title “Letter I” and those to the right of it were written with a finer nib than the rest. Courtesy of the Huntington Library and Art Gallery.